The definition of the word “burrow” is: to move underneath, or press close to something in order to hide oneself or in search of comfort. If only there were more albums that did this. It’s these kinds of albums that are filled with songs that continue to burrow inside of your mind long after first impressions, growing and filling space with time, the way houseplants do. Amid the monolith of sound pouring down, there are moments of repose and longing, as heard toward the end of the album’s third track, “Warm,” when vocalist Jordon Strang’s voice shifts, singing out, “I’m not about to leave / I’m just not used to feeling.” As the album progresses, you’re greeted with more of these tired moments. The album’s eighth track, “Ache,” begins as a whimsical-sounding dream-pop number before sliding into a lull that wouldn’t sound out of place on Slowdive’s Souvlaki or Just For a Day albums. The track finally evolves again into crushing riffs, reminiscent of HUM or Cloakroom’s heaviness. If Only ends with otherworldly bent riffs, musicianship that would bring a smile to Kevin Shields’ face. 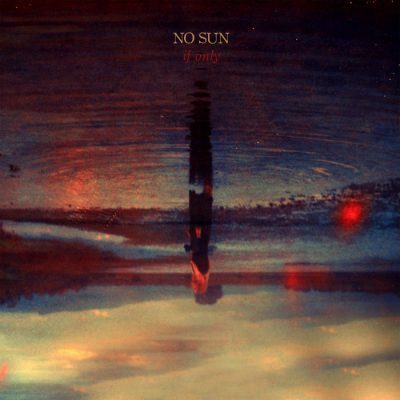 No Sun are a breath of fresh air, and If Only offers substance and honesty to a new class of shoegaze, a genre so often steeped in tradition that it begins to turn in on itself. It’s been nearly a year since No Sun released the Warm EP and headed back into the studio to record with Andrew Goldring at Soundcave Studios. It’s been a year well spent, showing refinement and maturation as they cover more musical ground. This experience seems to allow them a sense of freedom to change without fear, just as If Only changes like the color of leaves as it moves from track to track.